Born in Melbourne Australia, Jacinta Maree considers herself a chocoholic with an obsession with dragons, video gaming and Japan. 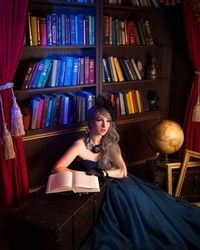 She writes a variety of genres including paranormal, steampunk, horror, science fiction, dystopian and supernatural. Multiple award winner and bestselling author, Jacinta writes to bring enjoyment to others while fulfilling her own need to explore the weird and the impossible. To ask Jacinta Maree questions, please sign up. Jacinta Maree When she awoke, her legs were still gone. Not a question as such just awesome to see you on the forum.And what’s it like now you’re world famous ? STORYFINDS is currently having a pretty awesome competition. Winner gets a professional book trailer made, and well... I reckon that sounds pretty cool so i threw my hat into the ring. Sarah **Loves Adrian Ivashkov** wrote: "Thank you for the friend request!" And thank you so much for the accept. I quite enjoyed reading your reviews.